Do you want a high-performing vacuum but not want to pay extra for a brand name or features that don’t add much value? This article will appeal to practical vacuum shoppers. The people who don’t want to spend the money on one of the top-of-the-line vacuums but also know you get what you pay for and don’t want to go with one of the cheapest vacuums. This leaves you with the best vacuums for the money or the best value vacuums. In other words, the best value vacuums are a minimum of a top 25 performing vacuum but also is unusually affordable for its class. Do you have a max amount you'll pay for a vacuum? Yes. My max is $200. Yes. My max is $300. This Shark Navigator NV358 is in the same category as the Hoover Wind Tunnel 3… it’s not the cheapest on our list, but it competes with some of the major name vacuums that will cost you twice as much. You’ll love its powerful suction, ability to clean all floor types (from high-end carpets to hardwoods). Many vacuums with HEPA systems aren’t sealed so dust particles and allergens bypass the filter, which defeats the purpose. This vacuum has a completely sealed HEPA system–my favorite feature. I rank this vacuum as #2 on suction/cleaning and #1 on features on this list. It would top the list except I knocked it down some since cost is higher than others (and this is an “inexpensive vacuum list”). If you’re on a budget but can splurge a little, this is the vacuum I would pick. The Hoover WindTunnel UH30300 stood out for its powerful suction for a vacuum priced just over $100. It also has two features that I think are must-haves for today’s carpets: a HEPA filter and the ability to turn the brush on and off. The ability to turn the brush off is critical to prevent damage to some carpets–often times Berber and frieze carpets can fall in this category. The only drawbacks are suction is too high to clean delicate items like drapes, and it can’t be turned down. It’s also a bagged vacuum, which I think is better in many cases but understand some people strictly want bagless. Best for under $100; great for extreme budget seekers, surprising performance and versatility for the cost. This Dirt Devil vacuum has shockingly good performance for under $100. Let’s keep this in perspective: most under $100 vacuums are junk. They don’t clean well, break easily, and don’t have many extra features. Still, this vacuum competes with many vacuums closer to 2-3x the price. The suction works on both carpet and hardwood. It has accessories to clean upholstery in your home and other furniture. It’s easy to maneuver, and it has a beater bar that can be turned off which is great for Berber carpets and hardwood. It won’t get your carpet as clean as our top 2 picks nor does it have a HEPA filter, but it’s still a great bang for your buck vacuum for the extreme budget seekers. Over $250: This is the high-performance tier. In fairness, there’s a huge range in this tier, but I’ve found that when you get over $250 you start getting the people who are willing to pay for the top product. They are willing to shell out the money to get the top performing vacuums, or in some cases, a vacuum that has specific features they want (made of metal, completely sealed HEPA system, etc). $125 to $225: This is what I call the vacuum sweet spot. Manufactuers know the majority of shoppers are on a budget but are still willing to invest in a high-quality vacuum because it’s an investment that makes their lives easier for many years. To respond to these shoppers, popular brand name vacuums make “economy” classes of their high-end vacuums. These affordable versions often just sacrifice a few features you may not even use. You also find less-marketed brands that produce some of their best products for this price category. The best overall vacuums may be “excellent” in all categories: suction, allergies, pet hair, hardwood, extra features, and so on. The best vacuums for the money might be “excellent” in 8 out of 10 categories but “fair” to “good” in the other 2. It allows them to be significantly cheaper, but still nearly as high performing. 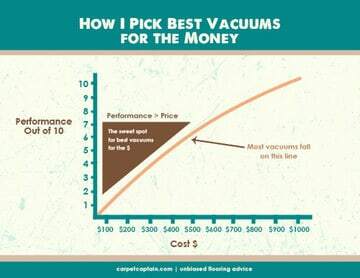 The key is to figure out which vacuums are more affordable because they are “fair” in performance qualities that don’t matter as much to you. That why you’ll notice in our top 3 vacuums I highlighted what each vacuum excels at. Should you avoid brand names? Big brand names tend to spend big money on marketing. This extra marketing spending has to be made up somewhere, and it’s often in the cost of their top models. So does this mean you should look for vacuums only in lesser known brands? Not necessarily. Brand names tend to create a few affordable vacuums. They know many shoppers have a budget, and it’s not a market they want to miss. The great news for value shoppers is many times these “affordable” vacuums are nearly identical to higher-end version. They might just be missing a few add-ons so the company can justify the lower price. Many refurbished vacuums are reduced $100-200 off the retail price. This can bring a top performing vacuum down into a more affordable range that makes it a steal. There are some risks. Refurbished vacuums usually come with shorter warranties. From my experience, refurbished products tend to end up working out great. Often there was an initial defect (cosmetic or performance), the company fixes the problem and the vacuum is the same as new. I think the best value vacuums is what most shoppers want. They know their vacuum is a long-term investment. They want a vacuum that makes their life easier and gets their home spotless, but they don’t want to pay extra for marketing and bells and whistles they’ll never use. Since vacuum tech improves over time, some of the more budget friendly brands are making excellent performing vacuums. The big-brands also know they need to appeal to the more price conscious market, so they make some of their top-of-the-line vacuums more affordable. The result is a win for you. Let me know if you have any other questions on getting a vacuum with the best bang for your buck.